Hemingway’s “The Snows of Kilimanjaro” (1936) is one of the most prominent literary references in the original material. I’ve been including the publishing dates of all the novels the show has referenced thus far because I suspect the staff might have picked them with this (among other things) in mind. After all, most episodes reference either Hemingway or Fitzgerald. As contemporaries, both have quite a history of friendship and rivalry, but I digress. For the past twelve weeks, I’ve been unable to shut up about the way this show uses color, and boy the color palettes–especially the greens and blues–in this episode are gorgeous. The animation gets rough in some parts, but what really makes the action work for me are its two main focuses: Ash is Freakin Terminator and emotion. The original material actually has characters comparing Ash to figures like Rambo and Terminator, so I’m pleased to see these vibes coming through again here. When I say Terminator, I don’t mean cool robot body horror (stop boing). I’m talking about the attitude, of course. We have Terminator mode during most of the train fight, with an Ash that calmly and coldly walks towards their panicked targets. He doesn’t even flinch when he takes a damn bullet to the shoulder! This is without even mentioning the fact that he fights alone in a train full of people trying to kill him. At some point, he contemplates the possibility that he might not make it, but the strain only really shows when he fights Arthur. In the train, the decadent green that has been established as the color of Ash’s world dominates. The colors chosen for the graffiti are an extra nice touch. We have emotion during the confrontation between Ash and Arthur, with emphasis on the tension and specific blows. Here, purple dominates the sky, already telling us that someone was going to die even before the fight started. The adaptation explains how Arthur got his scar, but the “real” reason he hates Ash so much remains ambiguous. It’s not hard to fill in the blanks though. As Arthur mentions the things he has done to “get rid” of Ash, we see nothing but the straight lines of the tracks of the train, which emphasize an uncomplicated, straightforward mind. During Arthur’s last moments, we see his hand desperately trying to grab Ash. As he starts to fall, his hand reach out for the sky–most likely a symbol of his ambition. A few seconds later, he’s gone. Ash wins, but it’s not a fight he really wanted to have in the first place, and he takes no pride in his victory. On the contrary, his eyes immediately find Eiji’s, and his painful outburst reveals that, when facing the person he cares about the most, he’s ashamed of the violence he was part of. Ash and Eiji coming from different worlds it’s a running theme here. In this episode, Eiji questions this, hurt after learning about Ash’s order to send him back to Japan. To explain what I mean with the leopard scene, I have to mention that originally, we got the whole thing when Eiji went to the library to apologize to Ash. Here, we get the leopard story only when Ash remembers it, feeling his death is near. It’s a nice modification, because it strongly implies that Eiji’s words are what harden Ash’s resolve to keep fighting. This is combined with a scene of a worried Eiji, who begs Ash to live as he desperately runs to him after learning Ash’s life is on the line. 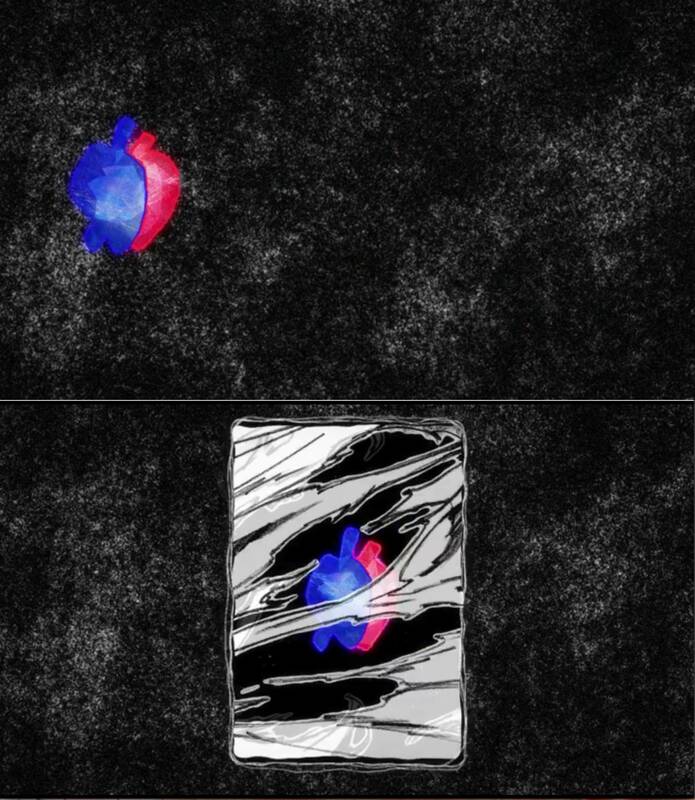 As Eiji runs to Ash, his blue dominates the scene. In episode 12, we got a green-blue combo with Ash and Eiji wearing each other’s colors (I’m totally counting that denim jacket) and blue in the atmosphere while Eiji wore green. This week, we get those colors dominating their scenes and “coming from different worlds” is mentioned again; Ash fights for his life in decadent greens, Eiji is safe in blue. Eiji also literally runs to Ash’s violent world while blue is present. Colors are good. When Ash talks about his death, Eiji tells him that “he’s not a leopard” and that he, as a human being, can change his destiny. This is the first time green–which represents Ash’s decadent, poisonous world– is presented as a warm color in the atmosphere. Eiji wears and is surrounded by green, but rather than being dominated by the color, it’s his warmness what dominates it. Sound effects are also good! An extremely worried Eiji can’t help but scream for Ash as soon as he sees him, and we hear the same sparkles the show used in episode 10, when Ash was looking for Eiji in the mansion to rescue him. In both cases, the sparkles sound when Ash hears Eiji from an impossible distance. I joke about Ash having an “Eiji Sense,” but this is actually a way to highlight how connected Ash is to Eiji. Something that I also find note-worthy: the same window is used with both boys when they’re feeling unwell (to say the least). 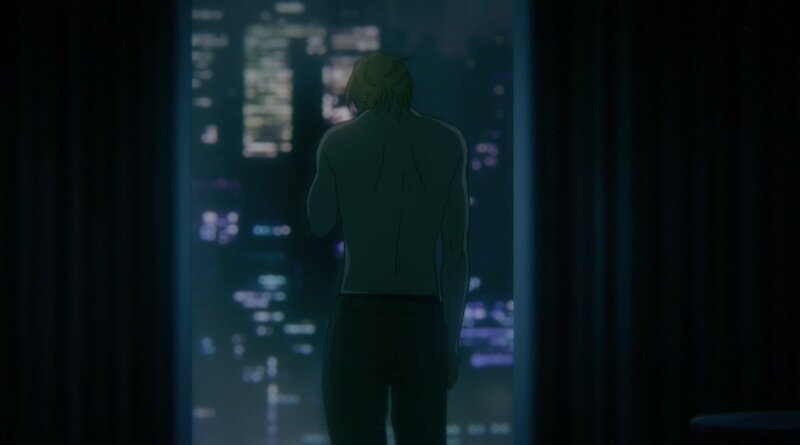 We see Eiji’s reflection against the city when he’s hurt. We see Ash’s back as he stands in front of the window when he wakes up, shaken after a nightmare. In both instances, as both boys feelings are disturbed, they are portrayed as being lost against the city. In Ash’s case, the framing isolates him from his surroundings. The second cour starts next week. I’ve been enjoying this adaptation a lot–I mean, I’m in pain most of the time, but you get the idea. However, if I’m frank, my biggest concerns all come with the second half. I’m also absolutely unprepared for even more goddamn pain. This is not a good combination, folks. On a more positive note, some of my favorite things in the series are also in the second half! So let’s all be strong. Or not. Alas, keep this hopeless blogger in your thoughts. Or not. If you would like to see more of this, please consider supporting my Patreon to help me keep the site running. Thank you! Or you can leave me a little tip! That’s a cool catch about the word “Forever” in graffiti, with the half-blue, half-red heart. I didn’t notice it! I’m excited (though pretty anxious) to see where things go from here. I’m a non-manga reader. I’ve really been resisting because it’s been so exciting to watch each episode and have no idea where it’s going to take us. Previous Previous post: Review: Will I Be Single Forever?